Marshmallow Pops Melt chocolates in a microwave safe bowl at 70% power until smooth. 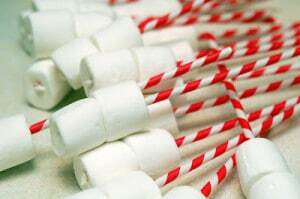 Thread 2 marshmallows on each straw. 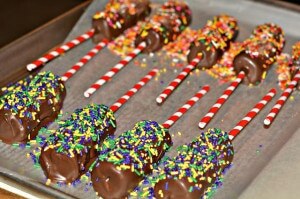 Use a spoon to coat them with melted chocolate and tap off excess. 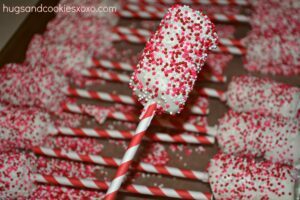 Add sprinkles/candies immediately and lay on wax paper until set. Wrap individually in cellophane or serve as is! JUMBO TOASTED MARSHMALLOWS STUFFED WITH ICE CREAM & HERSHEY BARS! 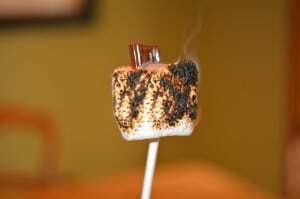 THREAD SOME MARSHMALLOWS ON A CUTE STRAW OR STICK. DIP IT IN METED CHOCOLATE. LET SET ON WAX PAPER. ADD SOME CHOCOLATE DETAILS AND SPRINKLES! VOILA! SPRINKLES FROM ABC CAKE DECORATING! I LOVE MARSHMALLOW POPS! 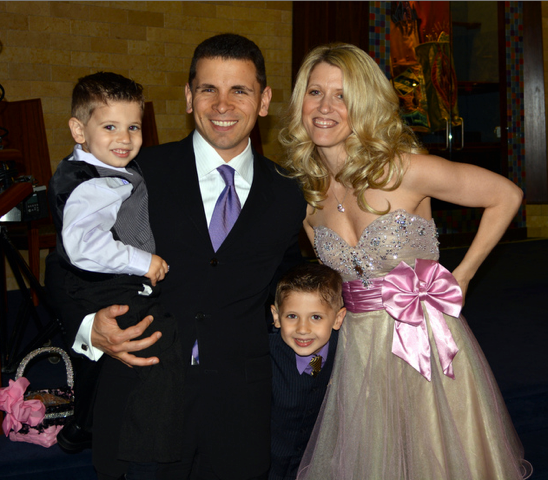 EASILY ADAPTED TO ANY OCCASION AND GUARANTEED TO MAKE OTHERS SMILE! 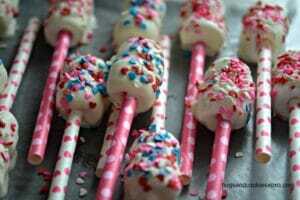 SIMPLE SKEWER 2-3 MARSHMALLOWS ON A STRAW OR CANDY STICK. DIP IN THE CHOCOLATE OF YOUR CHOICE! DRIZZLE WITH ASSORTED COLORS. ADD CANDIES AND SPRINKLES. TIME TO WRAP!